A common mistake inbound marketers make with Twitter is not realizing its full potential as a way to bring in more revenue. 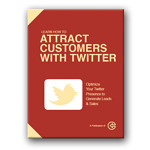 In fact, 42% of companies have acquired a customer via Twitter. Even though the process can become frustrating, the data is unmistakable. Social media is a powerful mechanism to attract a targeted traffic as well as convert that traffic into leads.